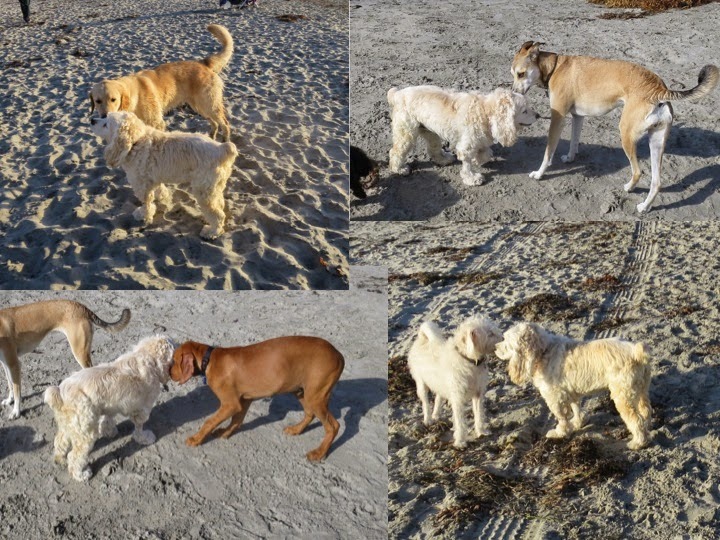 When we go to dogbeach, dogs come over to Annie and tell her secrets. I try to socialize with everyone, but no one tells me secrets. I asked Annie why that is. Annie barked that it was very obvious. "We go to dogbeach where everyone with three or four legs is a dog. You Rosy, are a Princess so they do not feel like they can tell you common secrets." It is so nice to know that the dogs recognize and respect my Royal status. I want to play in the ocean! It's so cool that the dogs at the beach understand their place in your world, Rosy! It's nice you let them speak to Annie. She seems to be really popular as a confidante of all the dogs on the beach! All those dogs seem to be similar in color to Annie. Who do the black and brown dogs speak to?